Not everyone gets the chance to play a cult-classic table game in a land-based casino, where you get to put your chips down, and see what set of cards you'll get to play with. That's the reason why the bright people behind Seven Deuce Gaming decide to develop Texas Switch into an online casino game that's accessible via laptops, Macs, tablets, and smartphones. To put the cherry on top of the icing, the developers decided to add a bit of flame to this traditional table game that will light up your screen for the whole night! With a multi-skilled team filled with talented coders, creative artists, and innovative game developers who aim and succeed in releasing iGaming products with original content, Seven Deuce Gaming have etched their mark in the list of top gaming developers worldwide. They don't just find and bring the most skillful people together in 1 location, but in multiple locations like Sri Lanka and the UK, which are where their offices are based. Their inspiration for the expanding evolution of technology and contribution of iGaming products to provide to the casino gamers of the future is what drives them to develop and release only the best games on the market. And after receiving so much praise from Swap The Flop, Double Ditch Hold 'Em, and All-In Poker Split, there's no way that you will be left disappointed with Texas Switch! If you've played the original Texas Hold 'Em before, then you will have no problem in getting into grips with this table game. The objective behind Texas Switch is pretty simple; you play or switch the hand that you'd have at your table, and beat the dealer with a higher combination that he would have. Firstly, you need to make a bet on the ante and blind and the bet before you play. You and the dealer will have 2 cards facing down in front, and you'll have 5 cards set at the middle of the table which will be the community cards. You also have the option to look at your cards before you play, and if you don't like them, you can place them in the square and be dealt with 2 new cards. If you looked at your cards beforehand, you then have to make a bet that's equal to 2 times the amount of the ante. If you made a bet beforehand, then you'll have to stick to that bet. After you've placed your bets, you'll be allowed to turn over 3 cards from the community card set. Once all that is done, the last 2 community cards, the dealer's cards, and your own cards turn over. If you've also checked the those final 2 cards beforehand, you'll have to raise your bet that's equal to the ante, or fold, which will make you lose the the ante and blind bet. If you've already raise the bet, you cannot add more to it and play. 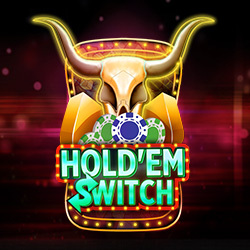 The winning hand will result in a value that's between 3 of a kind and a Royal Flush, and that is something that can be easily achieved on Texas Switch! Seven Deuce Gaming have managed to bring this classical table game to your screen, which makes you feel like you're actually sitting at a real table at a lively, fancy casino venue. If you're a player that loves to feel the adrenaline of competing against the dealer, and only using that cards in your hand as a weapon to beat that dealer, get back home from work, or spend some of your free time playing Texas Switch today!